Roasted potatoes are a simple, satisfying side dish for any meal. Here are eight chef’s takes on this crowd-pleasing dish. Paul Bertolli, owner of Fra’ Mani Artisan Foods and a former chef at Chez Panisse, adds olives and chopped garlic to potatoes during the last 10 minutes of cooking, so the flavors are vibrant. Lachlan Mackinnon-Patterson, of Frasca in Boulder, Colorado, slow-roasts Yukon Golds over hot coals, which concentrates their rich flavor. 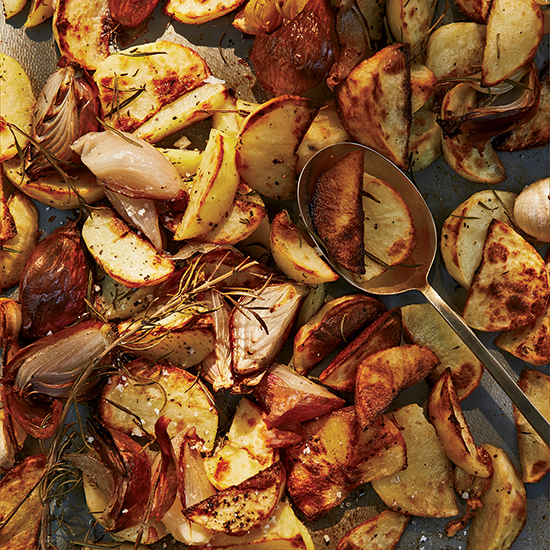 TV chef Curtis Stone preheats a baking sheet before roasting his potatoes with herbs until perfectly crisp. Michael Tusk, of Quince and Cotogna in San Francisco, roasts his potatoes with white wine, which forms a delicious glaze. For a more luxe take on roasted potatoes, Jacques Pépin roasts halved fingerlings and garnishes them with pressed caviar, serving them as hors-d’oeuvres. Boiling potatoes first, as Scott Conant of the Scarpetta empire does, makes them extra fluffy on the inside and crisp on the outside. Washington, DC, chef Fabio Trabocchi pan-roasts boiled potatoes before tossing them with pancetta and fresh dill.